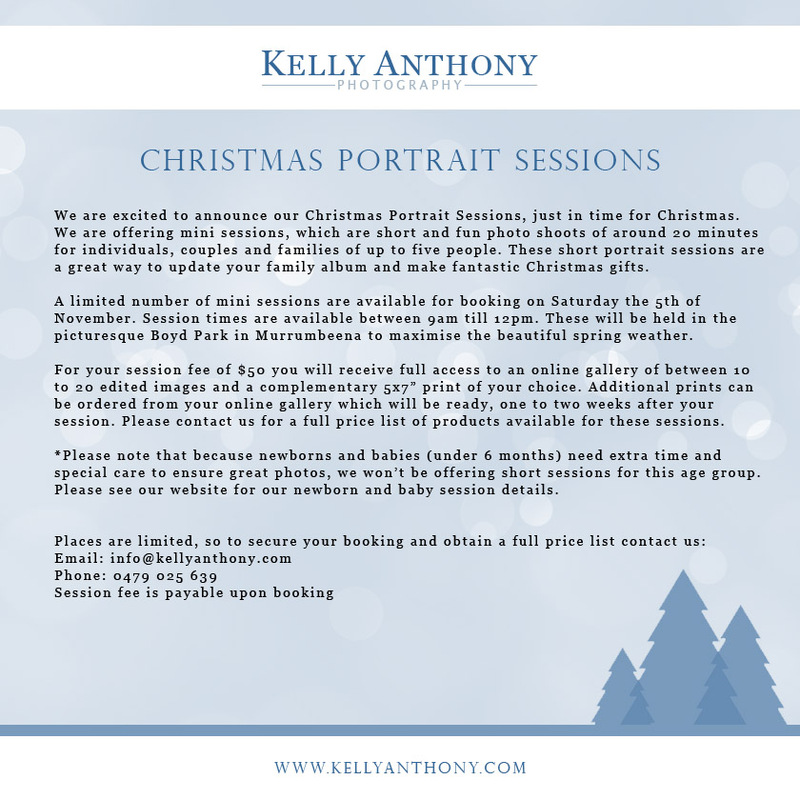 We are excited to announce our Christmas Portrait Sessions, just in time for Christmas. We are offering mini sessions, which are short and fun photo shoots of around 20 minutes for individuals, couples and families of up to five people. These short portrait sessions are a great way to update your family album and make fantastic Christmas gifts. A limited number of mini sessions are available for booking on Saturday the 5th of November. Session times are available between 9am till 12pm. These will be held in the picturesque Boyd Park in Murrumbeena to maximise the beautiful spring weather. For your session fee of $50 you will receive full access to an online gallery of between 10 to 20 edited images and a complementary 5×7” print of your choice. Additional prints and digital files can also be ordered from your online gallery which will be ready, one to two weeks after your session. Please contact us for a full price list of products available for these sessions. *Please note that because newborns and babies (under 6 months) need extra time and special care to ensure great photos, we won’t be offering short sessions for this age group. Please see our website for our newborn and baby session details.